Some people just can't do coffee. It makes them too jittery, causes them anxiety, and is awfully acidic for people with GI problems like acid reflux. In fact, you may have discovered for yourself that it's not uncommon to feel sick after drinking coffee, especially when it's strong. So, if you've been trying to quit your addiction to the cup of crack, just can't tolerate it, or never liked the stuff in the first place, there's a trendy solution for you. Sure, there's always been plain green tea and black tea, but the latest anticoffee trends are much more exciting, with the same comforting, soothing ritualistic aspect of sipping a frothy cup of joe. Keep scrolling to discover three delicious, buzzy coffee alternatives growing in popularity. If you live in a health food–obsessed city like Los Angeles, you may have already seen the Matcha latte make a menu appearance, but it's not long before this frothy green drink becomes more widespread. Regardless, it's super-easy to make at home. We first heard about it a few months ago, when L.A.-based nutritionist Elissa Goodman told us she makes one for herself and her daughter every morning. Goodman blends all of the following in her Vitamix: 4 ounces almond milk, 4 ounces coconut milk, 1/2 teaspoon organic matcha tea powder, 1 tablespoon coconut oil, vanilla stevia, pure vanilla powder, and cinnamon. "We both love this grassy blend," she says. "It’s not only full of antioxidants, but it helps keep my energy and focus strong. The addition of the healthy fat (coconut oil) helps to keep me satiated until lunch." Yum! We wrote about the rising popularity and incredible health benefits of turmeric here, and a Byrdie team member turned us on to the creamy turmeric latte, which helps with digestion and curbs sugar cravings. She boils 2 cups of filtered water, adds a handful of fresh sliced turmeric root along with ginger root, and adds 2-3 cinnamon sticks. She lets it simmer until the water is a dark orange color, after which she strains it and adds frothed coconut milk. (We're salivating). Two cups makes four servings, so you can save the additional servings to reheat for a few days straight. For a quick in-office version, she adds powdered turmeric to warm milk with a dash of cinnamon. By now you've probably heard about Bulletproof Coffee. We covered the cult diet trend here, and now it's time to meet its lesser-known sister, Bulletproof Cacao Tea (shoppable below). It's getting more popular by the day (people love this stuff), and it offers a great alternative for those not drinking coffee. 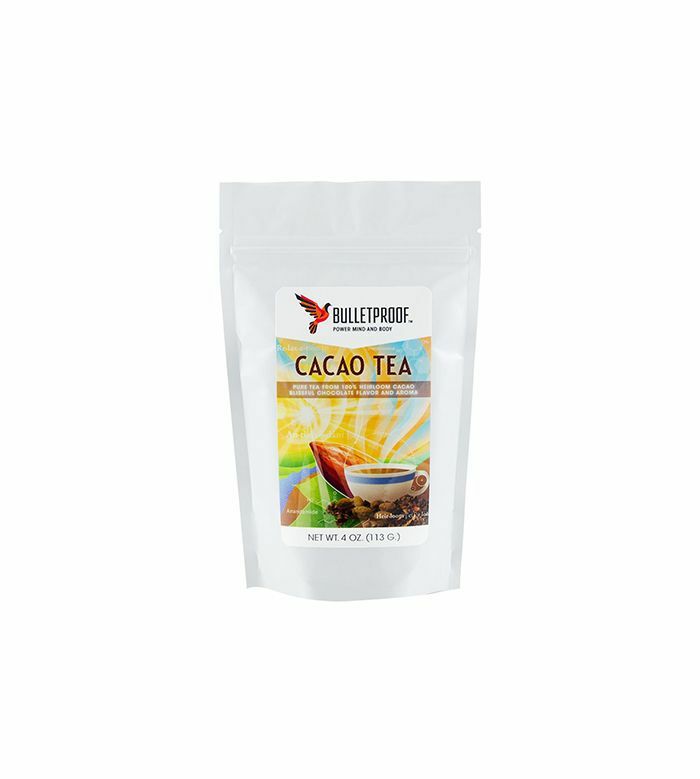 Made from cacao beans, the tea tastes rich and chocolaty, with a boost of caffeine from the cacao. It's high in antioxidants to boot. Mix 2 teaspoons of the coffee into 1/2 cup of filtered hot water combined with 1/2 cup of coconut milk and 2 tablespoons of Kerrygold butter, for the full Bulletproof effect. Keep scrolling to shop the Bulletproof Cacao Tea.